Diana Raab, MFA, PhD, is a poet, memoirist, blogger, speaker, and award-winning author of nine books of nonfiction and poetry. 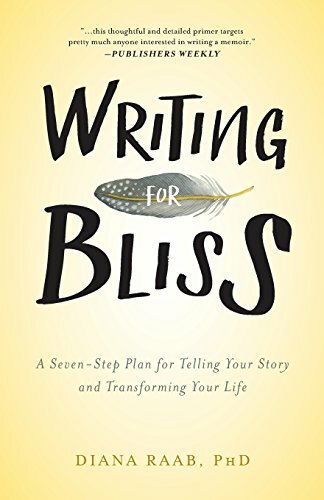 Her latest book is Writing for Bliss: A Seven-Step Plan for Telling Your Story and Transforming Your Life. She is also the editor of two anthologies, Writers and Their Notebooks and Writers on the Edge; two memoirs, Regina’s Closet and Healing with Words; and three poetry collections, including her latest, Lust. As an advocate of personal writing, Raab facilitates workshops in writing for transformation and empowerment, focusing on journaling, poetry, and memoir writing. Raab blogs for Psychology Today, Thrive Global, Om Times, and Elephant Journal. Welcome Diana and thank you for joining us today at Reader Views. What is Writing for Bliss about? Writing for Bliss is fundamentally about reflection, truth, and freedom. With techniques and prompts for both the emerging and seasoned writer, the book inspires readers to explore their creative natures through storytelling and poetry, examines how life-changing experiences can inspire writing, encourages self-examination and self-discovery through the written word, and illustrates how published authors have been transformed by writing. By sharing personal anecdotes throughout, I honor my lifelong passion for writing and its therapeutic effects. Suitable for both emerging and esteemed writers, it’s also packed with tips, writing prompts, references, and suggested reading. Why did you write Writing for Bliss? The book is a culmination of my life’s work—meant to inspire the burning writer who lives within. Ever since my mother gave me my first journal after my grandmother’s suicide when I was ten years old, I have used writing for healing. This book is an offshoot of my doctoral research on memoir writing for healing and transformation. After getting my PhD, I continued my path of teaching writing-for-transformation workshops. Many participants told me that I inspired them to write, and asked if I would write a book they could use as a reference after the workshop ended. This provided me with additional inspiration to write this book. Some of the results of my research is shared in Writing for Bliss, which includes quotes and excerpts from esteemed writers I interviewed. There are a lot of craft books available for new and developing authors full of great advice depending on where you are on the writing journey. What distinguishes Writing for Bliss from other books in the genre? Writing for Bliss is of interest to those who want to know more about writing for healing and transformation, while offering many general writing tips. It’s useful for emerging and established writers, as well as clinicians and professionals. Reviewers have said that Writing for Bliss is like a merging of Natalie Goldberg (a popular Zen writing teacher) and the Dalai Lama. Further, the book is easy to follow. I’ve always had a knack for simplifying complicated information for my readers, which is what I did in Writing for Bliss, where I made my findings accessible to both the general public and academics. My colloquial writing invites readers to study the art of writing, while sharing my own experiences and those of other writers I know. I’ve overcome my own life obstacles and taught writing for many years, so I know how to guide and inspire my readers and students in a gentle, nonthreatening way. The book is sprinkled with many writing prompts, and there’s also an extensive appendix with references and recommended reading. In your introduction you talk about the importance of maintaining a beginner’s mind whether you’re writing for bliss, healing or transformation. What is the beginner’s mind and how does it affect what we write? The idea behind the beginner’s mind is that you are open to many possibilities, unlike the expert’s mind, which tends to only see a few. Remaining open-minded and available for new ideas is important. This is something we see in young children, who are like sponges for learning. Having a beginner’s mind is also about suspending your disbelief and going with the flow of your experience, which also allows you to go with the flow during the writing process. Talk about the emotional process of telling one’s story. Emotional writing can be so healing but getting to that point can be painful, especially if you’re dredging some not-so-pleasant memories. How does one even get started bringing those experiences to the surface? Writing with your emotional truth is about writing from your heart, rather than entirely from your mind. The emotional truth of a story or experience is the truth of how you feel about your experience. It’s writing that examines feelings and sentiments instead of that which recounts an experience in a journalistic and detached style. Each person has his or her own emotional truth. Your emotional truth might be altogether different from that of another person, even if that individual lived through the same type of experience you did. When you write your story, whether in the form of journaling, an essay, a memoir, or a poem, think, Here is how I see it, or Here is how it happened to me, or This is my take on the story. The focus should be on the story, and the details and your feelings connected to it, always keeping your emotional truth in mind. The point is that the story you are writing should remain true to the way you lived through your experience. Not telling a story is what can deprive someone of bliss. In fact, it’s often the silence of untold stories that can get people into trouble. In other words, what is not said can be more harmful than what is being said. The best way to start . . . is to just start writing. Writing for Bliss has many suggested prompts to be used as a springboard to the creative process. All individuals have their own journeys and so should choose those prompts that resonate with them. Writing for Bliss has so much detail packed into a relatively small number of pages – do you have any best practices on how to best use the book? Should you read it all the way through then go back and do the writing exercises or what would you recommend? This is described in the introduction. Writing for Bliss will inspire and teach you to learn more about yourself; tap into your emotional truth; find your authentic voice; and write about your own losses, challenges, and joys. In doing so, you will be directed to a life characterized by joy, fulfillment, and purpose. By using these simple prompts and other writing techniques and tools that I suggest throughout the book, you will remember that it is when you connect with who you truly are that happiness ensues. In this book, I share my psychospiritual and creative journey as a way to guide you on your own journey. I write not only as a teacher, but as a fellow traveler interested in personal transformation through the writing process. The important thing is to keep an open mind and an open heart. I suggest reading through the book first and then going back and doing the writing prompts scattered throughout. During both passes, I recommend always having a journal and pen beside you, keeping in mind that you never know when inspiration may come and when you will be overwhelmed with inspiring ideas. The most important thing to remember during self-discovery through writing is to enjoy the journey, which is rather like the spiraling path of a labyrinth. A labyrinth is a wonderful metaphor for life, given that you follow a path inward and then go back out, using a circular, repeating pattern. Inside the labyrinth, as in life, there are times when we might feel lost and other times when our path flows more easily. We feel free. We feel blissful. We feel as if we are headed toward enlightenment. Just like life itself, the art of writing as I teach it here is also like walking a labyrinth. As you follow the suggestions in this book, you might suddenly be diverted or sidetracked into another writing project. And that’s okay, because creativity is not a linear process. It beats to its own drum and is done in its own time. It can be thought of as both cyclical and meandering. I think it’s safe to say that writing is your passion? How are you living that passion? Through all the books I’ve written, the many blogs I contribute to, and the articles I write. What do you like to do when you’re not writing? How do you find your non-writing bliss? I love nature. I hike. I read a lot. I also have begun a passion for growing bonsai, something I learned from my dear friend Thomas Steinbeck. Most of all, I love being with my children and grandchildren. I read all types of books, but my favorites are the genres I work in: memoir and poetry. I think if you want to be a good writer, it’s important that you immerse yourself in the genre in which you write. What book has most influenced your life? The Journals of Anaïs Nin. Follow your heart. Trust your intuition. Live your passion. Live and let live. What advice can you give to emerging authors? If you want to be a good writer, you need to be a good reader. As I mentioned above, read in the genre in which you wish to write. Also, remember that writing is a process. It’s also important to enjoy the journey, and not always have your eye on the destination. So, what’s next, do you have another project in the works? I don’t speak about my projects because I’m concerned that they will be jinxed if I do (yes, I’m somewhat superstitious). I have a few book ideas, and I will also continue to blog and write poetry, two forms I love. Do you have a website or blog (or both) where readers can learn more about you and your works? My website is www.dianaraab.com. I write regularly for Psychology Today, Thrive Global, and Elephant Journal. I’m also a guest blogger on a number of sites listed on my website.